When it comes to turning your backyard into a getaway or retreat, what is the first thing that comes to mind? Is it a private outdoor oasis, complete with water features and an outdoor kitchen? Or is it adding a terraced effect with exotic plants, detailed retaining walls and hardscape patios and walkways that make you feel that you are enjoying the seclusion of a five star resort? Your home should be your haven, the place where the world stops at the beginning of your driveway and your retreat begins. There is more to attracting birds than just nailing a bird house up to a fence post or hanging one off a tree limb. The species of birds you attract depends on the type of feeder you choose, the placement of the feeder in your yard and the type of feed you put in the feeder. Here are five categories of birds you may want to consider. All come with their own distinct colors, sounds and traits. 1) Goldfinches: These birds are yellow in color, with the males being more vibrant in the spring season. They are small in stature and shy by nature. You can use everything from Thistle sacks, which are inexpensive and easy to reposition in the yard to small “clinger” only feeders to various types of triple-tube feeders. For the sake of the length of this article, I will give you a resource you can go to and learn more on the various types of feeders. The type of feeder is important to the type of birds you are trying to attract, but even more important is the type of feed you use to draw specific species to your feeders. Goldfinches are partial to fine chopped Sunflower hearts and Nyjer seeds; Nyjer is a black seed cultivated in Africa & Asia and are high in calories and oil content. Another source of nutrition and a strong attraction for Goldfinches occurs in the autumn when the blooms from plants such as Marigolds and Zinnias are long past their pretty stages of summer. These create great feed for Goldfinches, so be sure to leave these in your garden or yard and you will attract flurry of activity from the Goldfinches, as they are storing energy for the winter. 2) Cardinals: A regal bird with its pointed crown and vibrant red color trimmed in black mask and neck. 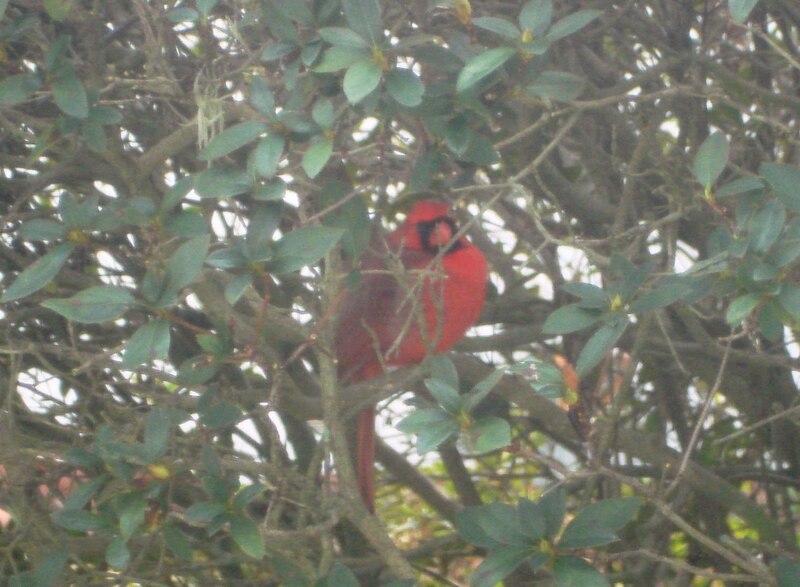 If you have ever seen a cardinal up close, you would remember it. It has a look like no other bird, in my humble opinion. Whether against the green of summer leaves or the white of winter’s snow, Cardinals are a splendid attraction to any setting. Here is how you can seduce them to your haven. They like feeders either low to the ground or with a platform they can eat from when hung from above. This is due to the fact they are a larger bird and require some space to maneuver. They do not eat from tube feeders, like Goldfinches, unless the tube feeder has a tray on the bottom for them to perch on. Their favorite feed is Sunflower or Safflower seeds; their big bill makes it easy for them to crack these seeds. The addition of a bird bath is another draw for the cardinal, as they love water. 3) Blue Birds: The nesting sites of Blue birds differ according to your region of the country. For your specific region do a little research and determine the best type of nesting site to build to attract these brilliant blue colored birds to your private retreat. They prefer open spaces so they can feed on insects, their main nutrition source. Another favorite of the Bluebird is live meal worms, so you may want to keep some on hand if this beautiful bird is going to be added to your yards color pallet. For winter nutrition, Bluebirds feast on the berries from Bittersweet & Holly. Again, the addition of a bird bath to provide a water source, especially in winter, will help coax the Bluebird to your backyard paradise. 4) Orioles: An orange bodied bird with black head and back, its wings have traces of white and yellow mixed in amongst black. Orioles are shy birds that migrate to South America for the winters. A great tool in the attraction of Orioles is oranges. Cut a few oranges in half on secure them to a gate or fence top and use them to bait the orioles into your yard. Another weak spot for Orioles is jelly, they love jelly. You can go to your local bird store and pick up an adapter that fits over the open end of a jelly jar and viola; you have a feeder for the Orioles you hope to draw in to your backyard. Due to the fact that Orioles are shy birds, start off by setting the feeders further away from active areas and then slowly move them closer, once you began to gain their confidence. This will give you the pleasure of watching this beautiful bird up close; I guess you can say “You’d have a Bird’s Eye view”. I know, really bad, but I couldn’t resist. Once you notice the Orioles you can leave twine, yarn and strands of hair for them to find and use in building a pendulum nest they will use for the season. Oranges, jelly and hosts who do not disturb them, they will love you for the season. 5) Woodpeckers: Last, but not least, in this selection of vibrantly colored and distinctively different birds; Woodpeckers are showy birds with colored plumage. Described as a clinger, because of its ability to grab on with its feet and attach itself to the sides of trees with no or little effort. They have spiny tail feathers, which aides them in climbing and resting on tree trunks. Typically go up and down tree trunks scrounging for insects, it is advisable to hang your feeders for these birds close to the trunk at first, to get their attention. Once you have their attention, you can move the feeder further out on the limb away from the trunk. Tree nuts and peanuts is the secret to luring these birds to your collection of featured wild life. Beware though, once a Woodpecker begins its assault on the tree of its choice; it could get noisy for some time to come. So there you have it, you have added gold,red, blue,orange and the rhythm of the Woodpecker to your Backyard Getaway. For more information on this subject I recommend The Backyard Bird Company. Take a minute and Google them, they are jam packed with great information. For all your Home Addition and Landscaping Ideas, please visit http://www.insideoutadditions.com. By clicking on the Designers and Contractors tab, you will find a free listing of local remodeling and landscape contractors; who you can contact directly. You will also find a comprehensive gallery of Landscape and Home Addition projects, ideas and designs. Many of which are supplied through the contractor’s own portfolio. Can any of these birds co-exist peacefully in the same yard?? I already have cardinals and I wanted to also attract the area goldfinches and bluebirds and orioles. I believe I have read that woodpeckers are aggressive so maybe that would not be a possibility. Thanks!! That is outside my area of expertise. Sorry.